Posted on Tue, Mar 13, 2012 : 12:52 p.m. Wondering how state and federal transit funding will flow to Ann Arbor and other Southeast Michigan communities if a new regional transit authority is formed? A two-page fact sheet laying out the basics is being circulated among local officials. It was prepared by Richard Murphy, transportation program coordinator for the Michigan Suburbs Alliance, and vetted for accuracy by the Michigan Department of Transportation. It analyzes how the funding would work under Senate Bills 909, 911 and 912, and House Bills 5309, 5310 and 5311. How money from the Federal Transit Administration would be divvied up to AATA and other transit agencies. 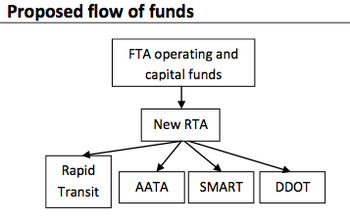 According to the diagrams in the fact sheet, the RTA would become the designated recipient of all federal funding coming into the region, and in turn that money would be disbursed by the RTA to local agencies like Ann Arbor Transportation Authority, SMART and DDOT. Each local agency would receive federal formula funding in amounts as if it had applied independently, so formula funds earned by one agency's ridership could not be diverted to another agency, according to the fact sheet. In a similar manner, the RTA would become responsible for distributing state funding coming into the region for local agencies. But a proposed rolling rapid transit system is not eligible for state operating assistance funds, so it would not reduce the amount of funding available to other agencies in the state. SB 911 would enable the RTA to levy either a special property tax or vehicle registration fee of no more than $1.20 per $1,000 of vehicle value, which is estimated to be $40 a year on the average vehicle. Any funding raised by the RTA from those sources would require voter approval by a majority of voters across the four-county transit region. The regional fee would be the primary funding source for the regional rapid transit network, but also could be used to support local service. Separately from the RTA legislation, SB 910 would allow counties to impose a vehicle registration fee not to exceed $1.80 per $1,000 of vehicle value for transportation purposes. That also would require voter approval. If the county is in the RTA, the maximum fee the county could impose would be reduced by the amount of the RTA's vehicle registration fee. The RTA wouldn't gain any control over locally provided funds such as the transit taxes that Ann Arbor and Ypsilanti residents pay for current AATA service. Conan Smith, chairman of the Washtenaw County Board of Commissioners and executive director of the Michigan Suburbs Alliance, said it's not yet clear what the Ann Arbor implications are with amendments being kicked around, but it's safe to say that AATA's revenue streams are protected and the opportunity to seamlessly connect into a regional system is built in. Wed, Mar 14, 2012 : 1:23 p.m. Wed, Mar 14, 2012 : 2:36 a.m.
As you think about regional mass transit, please consider the following: Although AATA and Ann Arbor believe they are the center of the mass transit universe, AATA is 11% of regional bus ridership. SMART has 21% of the region's bus ridership. DDOT has 68% of the region's bus ridership. It is logical that distributed funds go towards greatest need and use. DDOT is clearly the worthy candidate, serving most mass. We are talking mass transit, aren't we? And Ann Arbor, not counting UM students, has a full-time population of about 70,000. Numbers are from the State of MI, 2010. Tue, Mar 13, 2012 : 11:29 p.m.
to paraphrase the old joke... Q : how many Ann Arborites does it take to change a light bulb ? A: One...who holds the bulb while world spins around him. &quot;Each local agency would receive federal formula funding in amounts as if it had applied independently...&quot; From the diagram, there are four buckets under the new RTA in need of federal funding. The &quot;Rapid Transit&quot; bucket is brand new. So in effect there is one more mouth to feed. I still do not understand how the AATA is guaranteed the same level of federal funding when this new bucket is being added? Is the federal government increasing the federal transportation budget in order to keep all the existing agencies fully funded as well as funding the new Rapid Transit? Tue, Mar 13, 2012 : 8:50 p.m.
Can we go a week without another piece promoting this agenda? Tue, Mar 13, 2012 : 8:08 p.m.
Tue, Mar 13, 2012 : 7:46 p.m.
Hi Vivienne, the RTA legislation is still in committees in both the House and Senate and subject to amendment. These funding flows are unlikely to change given the extensive negotiations that happened to ensure our transit agencies across the region are protected. However, I'll post if something different occurs. My interpretation of the Finance Task Force report as a member of that body was not that we were nervous but that we knew the Legislature is considering a new funding source and it did not make sense to recommend a property tax if there were other options to evaluate. Last, the RTA is not entitled to take an admin fee from the agencies; it will be funded through independent means. The language you are recalling is this: &quot;The authority may withhold up to 5% of state capital and operating assistance from an owner or operator of a public transit facility within the public transit region that fails to comply with a coordination directive of the authority, as determined by the board.&quot; They may not spend that money and would return it when the agency comes into compliance. Tue, Mar 13, 2012 : 10:15 p.m.
&quot;Last, the RTA is not entitled to take an admin fee from the agencies; it will be funded through independent means.&quot; what does &quot;funded through independent means&quot; mean? Thank you for this story. It is useful. A couple of notes: 1. As is implied by the quote from Conan Smith, the legislation is still being crafted so its final form is not known. 2. The Finance Task Force headed by Al Berriz was quite nervous about this and left its report as tentative because of these uncertainties. 3. If I recall correctly, even if the RTA does channel the existing funds to AATA, they are entitled to take 5% off the top as an administrative charge.